February 18, 2006 July 10, 2008 - by Khoobg - 2 Comments. 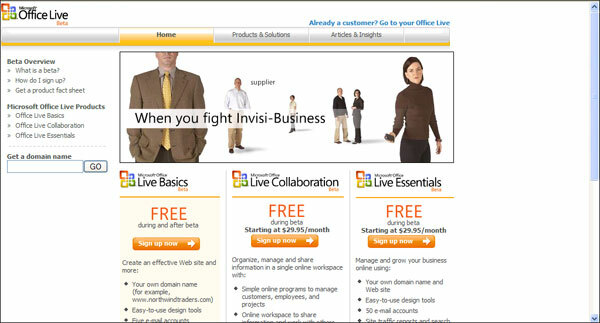 Microsoft launched Office Live Beta (http://officelive.microsoft.com) and the entry level Office Live Basics is free. It will be free as long as the user use within the provided resources and does not exceed the bandwidth usage of 10GB per month. However, 10GB bandwidth allocation is definitely enough for 5 emails and a simple web site. Office Live Basics, the free entry-level service, offers small businesses their own Internet domain, 2GB of e-mail storage for up to five accounts, 30MB of storage for a Web site and up to 10GB per month of data transfer. Those who set up a site with Office Live Basics also get access to simple site analytics such as page views and which browser customers are using to visit the site. Office Live pages can be built using a variety of customizable templates, and no HTML experience is needed.